We offer Wasps Nest Removal Services in New York NY, Westchester County NY and Rockland County NY. We have the Know How to Get Rid of Wasps. Dont let Wasps take over your property. Give Us A Call Today. 1-844-305-8999. We specialize in the removal of all Stinging Insects. 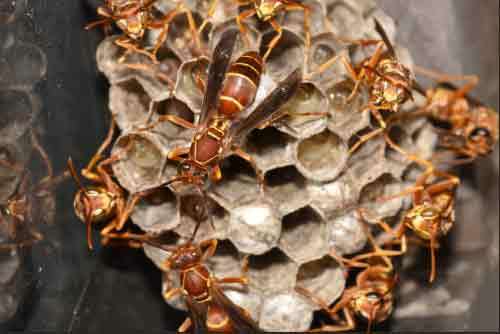 Paper Wasps get their common name from the paper-like material out of which they make their nests. Paper wasps are sometimes called umbrella wasps, after the shape of their distinctive nests. Paper wasps generally have a similar body shape to yellowjackets, but somewhat slimmer with a thin “waist,” with six long legs and an almost triangular side view, as well as two wings and antennae. They are mostly brown with some yellow coloration. Paper wasps in New York NY, Westchester County NY, Rockland County NY and in Orange County NY often build nests in residential yards, so one of the main signs of an infestation is the physical sighting of the nest itself and nearby wasps moving around the nest. 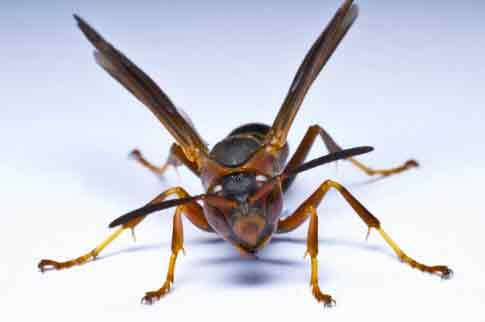 Paper wasp stings can be very painful and can cause the same risk of allergic reaction as other insect stings. The location of the sting will become red and swollen. 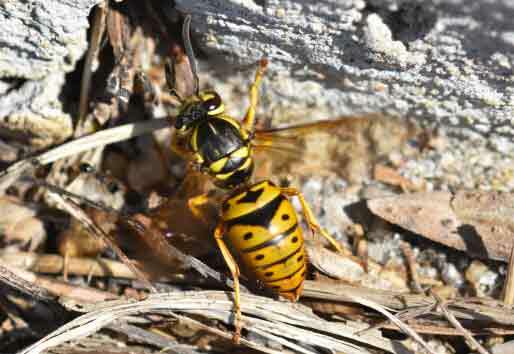 If you get stung by a paper wasp, immediately clean the area with soap and cold water. If the sting is on an extremity, consider elevating the limb. These bee-sized social wasps are black with yellow markings on the front of the head and yellow banding around the abdomen. The face is primarily yellow with dark eyes. Front wings of Vespidae are folded lengthwise when at rest. The large antennae are conspicuous. Due to their size, shape and coloration these wasps are sometimes mistaken for bees. Yellow jackets' closest relatives, the hornets, closely resemble them but have a much bigger head. The Yellow Jacket Wasp is a predatory insect that builds a large nest to house the colony. Wasps are very protective of their colony and will attack if someone approaches within a few feet of the nest. Yellow jackets like to be where humans live and are common visitors to picnics and parks in the summer as they are attracted to meat, fruit and sweet drinks. Paper wasps are vespid wasps that gather fibers from dead wood and plant stems, which they mix with saliva, and use to construct water-resistant nests made of gray or brown papery material. Some types of paper wasps are also sometimes called umbrella wasps, due to the distinctive design of their nests. 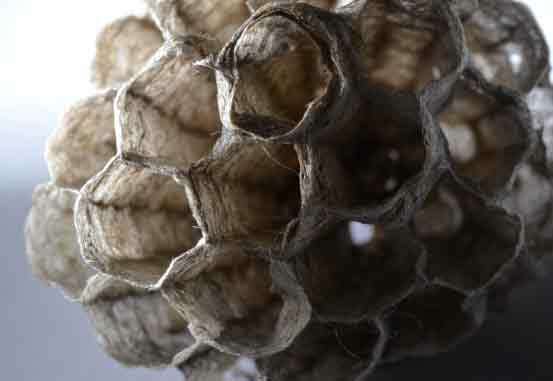 The Wasp Nest cells are a neat construction of hexagonal shaped cells, a super-efficient way to use space and fit compartments together, whilst using the minimum amount of materials. The nests are frequently found under the eaves of houses, in little used buildings and in attics. The nests are annual (used for only one year). If you notice you have Wasps on your property that you would like removed, Give Us A Call Today. 1-844-305-8999. We specialize in Wasps Nest Removal, Hornets Nest Removal and Bee Hive Removals.